Wishing to be a dominant financial force in one of the most repressed and isolated former communist countries, we established ourselves as one of the major trading companies involved in smuggling consumer products unavailable due to trade sanctions. At the time there were very few private banks and there weren't many avenues for the investment of money that relatives had earned abroad and sent home to their families. They would privately lend it out at relatively high interest rates to others who were starting businesses or they would place it into investment funds based on smuggling operations. The people, completely unfamiliar with the basic concept that return and risk are related, were putting money into our company because we were generating high returns for them. This was at a time when Albania, under UN sanctions, was the poorest and most isolated country in Europe. Knowing that once the sanctions were suspended our companies would lose a major source of income, we raised the interest rates paid to investors in early 1996 despite having no further income from smuggling. From this point on, our pyramid schemes became so popular that the face value of deposits in all the schemes amounted, at one point, to more than half of the countries GDP. People who invested their money, thinking they were going to make huge profits, were foolishly spending some of the money in advance. As significant contributors to the ruling party's election campaign during the growth of the pyramid schemes we ensured that there was governmental inattention to them. At one point, when over half the population was participating, we were taking in money so fast that we didn't know what to do with it and simply deposited it in state banks. We were promising to double investors' money in two months and were depositing it in banks paying maybe 25% a year. We made quite a lot of money, as planned, while the participants, particularly those who invested late, basically lost everything. The collapse of all of the pyramid-like ponzi schemes in 1997 set Albania back in terms of economic development by at least a couple of years and precipitated a near civil war in which there was a lot of destruction along with the deaths of about 2,000 people, out of a population of 3½ million. The government was forced during the riots to seize $400 million in the bank accounts of two of our competitors' schemes, and depositors in those two schemes got more than 50% of their money back. Ours, which operated on the scale of one of the largest banks in the United States transferred 93% of our revenue out of the country prior to seizure of the balance. It is recommended, that because these schemes flourish in countries with undeveloped financial markets, we begin the research which will allow us to target the geographic venue of our next major operation. One woman offered investors 20 to 30 percent interest monthly. Before her arrest, she was able to amass $50 million from naive depositors. She built a "pure" or fund pyramid like ponzi scheme and didn't bother to invest the money. Investor pyramids, on the other hand, carried through with some actual investments. They financed the construction of supermarkets, office complexes, and gas stations. Two fund pyramids put their money in commercial bank accounts. At the height of the pyramid fever in the last quarter of 1996, more than $250 million had accumulated in those accounts. Due to the high interest rates promised, those deposits represented just 40% of the pyramids' total liabilities. Luckily, the swindlers didn't try to shift the accumulated funds outside the banking system. In early 1997, as the crisis erupted, the central bank froze all $250 million, in part to protect the depositors but also to protect the banking system. The system could not have survived a sudden withdrawal of those deposits. The government later returned the $250 million to the investors, without interest. Owners of liquidated investor pyramids were also reimbursed, on average, at around 50% of their investment, in cash or deposit certificates, although the actual value of their assets is unknown. Many may not have been viable businesses and may have served only as bait to capture more depositors. A company in southern Albania invested in a few hotels and gas stations. It collected an estimated $100 million and then collapsed. Another company, the mightiest ponzi scheme, may have received as much as $500 million, which it invested in supermarkets, travel agencies, and real estate, and even in building and operating its own television station. Its assets exceeded $6 billion, at least on the books. The total value of deposits that the sixteen major pyramids received before the crisis exploded in early 1997-excluding the accrued interest at the time of the estimate-reached an astonishing $1.2 billion, or 50% of the country's GDP, according to some calculations. But the public could not believe that a scheme involving every other Albanian family would not be guaranteed by the government. Moreover, pyramid managers were seen at official receptions, and they were interviewed daily by the government-controlled television stations. Many protesters even claimed that the pyramids were the creation of the government, or more precisely, of the president. But the pyramids also reached other parties and other interest groups. MANILA, Philippines - The lure of fast, easy money was so hot that the investors should have known it was too good to be true: promises of returns of up to 60 percent a week on investments that one company claimed were safe with the World Bank. With an estimated two million Filipinos scammed, officials say losses in a rash of pyramid schemes may total more than the annual defense budget in the poor Southeast Asian nation. “The number of victims and the amount of money are close to unbelievable," said Sen. Robert Jaworski, who led a Senate investigation into the fraud. “The welfare of the general public is at risk. It is time to put an end to this nefarious scheme." 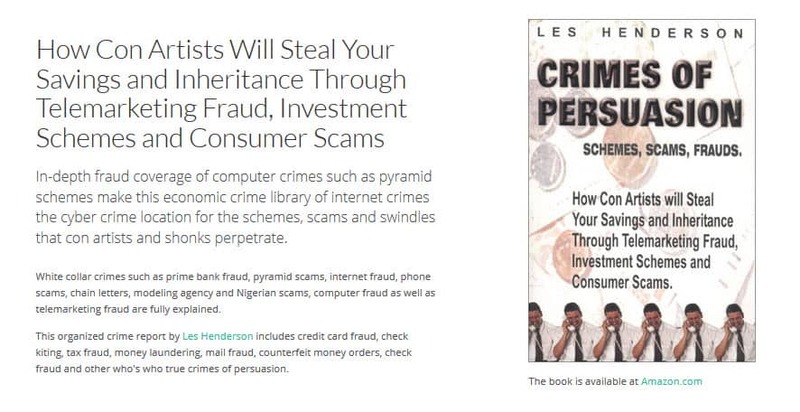 Ponzi schemes use incoming money from new investors to pay returns to older ones. They unravel when the investment companies’ owners flee with the money, the government shuts down the schemes or withdrawals add up to more than the fresh funds coming in, forcing the pyramid to collapse. Lawyer Ernesto Villagarcia, who represents about 9,000 clients with claims of at least P4 billion ($75.5 million), says most victims borrowed their stakes, sold property or used their retirement pay, savings or remittances from the millions of Filipinos working abroad. A 72-year-old man, dressed like a poor peasant, recently sought his help to recover the P38 million ($716,981) he claimed he lost from the P100 million ($1.9 million) he made by selling his large property holdings. Villagarcia, a former provincial governor who specializes in credit collection, said he and a government anti-pyramid task force estimate some two million Filipinos have lost about P60 billion to P75 billion ($1.13 billion to $1.42 billion). That is more than the P45-billion ($849 million) defense budget, or enough to finance the government’s school building program for the next 30 years or more. Maria Teresa Santos, an investment company owner who was arrested and ordered to testify before the Senate, claimed during a recent hearing that she put their money into the World Bank for 60 percent weekly interest. “You would ask yourself, 'Are they still sane or in the verge of lunacy?' because their statements are hyperbolic, fantastic," Villagarcia said. Most victims are too embarrassed to go public. An accountant named Charlie said he was enticed to invest P20,000 ($377) from his savings in 2001 on the promise of 7 percent monthly interest, compared with 3 percent to 4 percent a year from his bank. He also convinced two brothers, a sister and some friends to raise about P1.7 million ($32,000) to invest with Multinational Telecoms Investors, part of the Multitel group, one of about a dozen pyramid companies shut down by the government. “Trust was the key element," he said. An investment “counselor" gave him postdated checks, covering his monthly interest earnings, that he received upfront after making the investment. When he tried to pull out in August 2002, the company’s checks bounced because Multitel had been swamped with withdrawals from other investors after the scam was exposed. “We were just late," he said. After deducting earnings, his group lost 70 percent of their investment. Two embarrassed police officers said they and many colleagues borrowed money from the Armed Forces and Police Savings and Loan Association for their stakes. He said some officers lost all their earnings from UN peacekeeping missions in East Timor and Kosovo. “We are embarrassed to come out because people would call us stupid for losing money," he said. Another major fears that low-ranking patrol officers, forced to scrimp due to repayments of loans to fund their investments, might resort to extortion on the streets. “The policeman who wants a decent life would be subjected to temptations," he said. The National Bureau of Investigation reported that more than 4,000 cases of bounced checks, violations of security regulations and syndicated fraud, a non-bailable capital offense, have been filed against eight pyramid companies involving claims of about P566 million ($10.6 million) and $190,000 in US currency. Villagarcia, the lawyer, estimates only 10 percent to 15 percent of the victims will file charges, with the rest still hoping they will get paid eventually.